WARNING: What you are about to see and read may be confronting or upsetting. News.com.au does not publish this story lightly or carelessly, but does so in the knowledge that one in five Australian women miscarry their child, and many are left feeling isolated, confused and alone. We hope this story will both raise awareness and bring comfort, as it already has done to many families around the world. 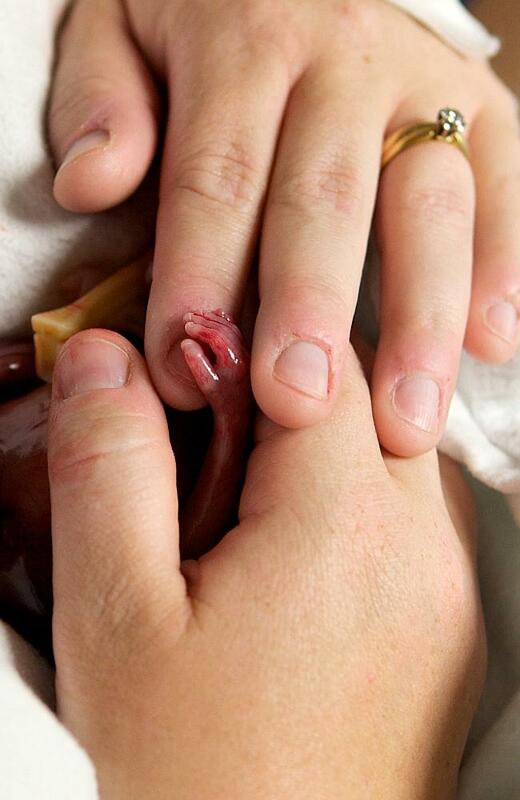 WHEN Alexis Fretz was 30 years old and 19 weeks pregnant, she began to bleed. Concerned but not alarmed, she called her midwife, who advised her to go to the emergency room, just to make sure everything was OK.
She was in the waiting room with husband Joshua in a hospital in Kokomo, Indiana, when she began to feel pain in her abdomen. “At 6pm a nurse came in and gave me three glasses of water and told me to drink up for an ultrasound, and then she left. I put on the TV and started watching House Hunters – I was assuming I wouldn’t be able to finish the 30-minute episode because they would come and get me, but I was very wrong. Initially, the nurses were sceptical and at 7pm she was taken for an ultrasound. The ultrasound technician was able to find a heartbeat, but afterwards, when Alexis went to the bathroom, she was still bleeding and her contractions were intensifying. Having been through labour twice before with her two daughters, she knew what was happening. “At this point there was no break between the contractions. Just as one finished another would start. I knew that I was at the end. I didn’t give up hope, but in my heart of hearts, I knew that I was losing my baby. “At some point the PA came in and said ‘your foetus is still viable’. I seriously wanted to slap her. When the doctor checked me and sat down beside me on the bed and told me that we were going to be delivering our baby, it was the first that anyone had called him a baby. “I immediately started bawling and asking if there was any other option. I was fully dilated and my water was bulging, so there was no other option at this point. “Walter was breech, so we were waiting on my water to break on its own and let nature progress at its own pace. I don’t remember what time I started pushing, but I was not feeling the contractions anymore after my water broke, so I did have to push several times to get his tiny body out. Alexis is a photographer, and she happened to have her camera gear in her car for a wedding she was supposed to shoot the following day. Joshua decided to go and get her camera. “I am so very glad that Joshua [did that]. At first I did not want any photos, but they are the only thing I have to look back on now. I don’t understand why the Lord took him home, but I have to trust in his perfect timing. I may never know why, but it is a comfort to know where he is and that I will see him again. In his short life of just a few minutes he has touched more lives then I ever could have imagined. I’m still in shock at how much his photos have been shared and commented on,” she said. 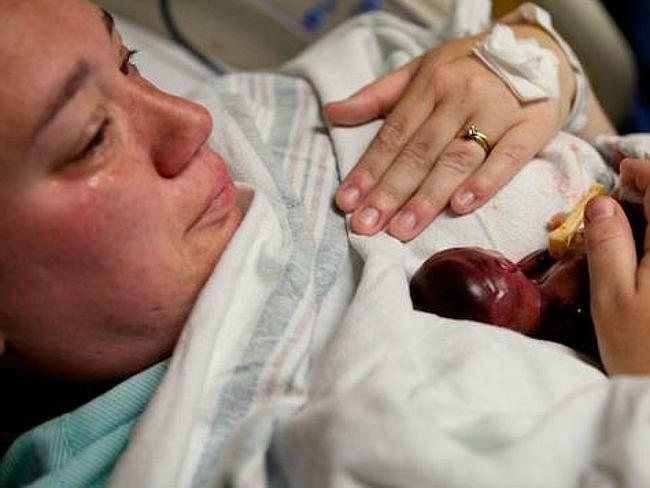 The photographs have opened discussion surrounding miscarriage, with Alexis and Joshua’s story being shared all over the world by mums, fellow bloggers, support groups, and families who have lost children of their own. The response is not necessarily surprising – in America, where Alexis is from, almost one million women miscarry their babies each year. In Australia, one in five women miscarry. While the Fretz family are glad their loss has opened up a new form of dialogue, it was an unintentional outcome to sharing Walter’s story. “I wrote our story because I live in a small town and have for my entire life,” Alexis told news.com.au. “When we returned from our trip to Indiana without a pregnant belly or a baby in my arms, I did not want to have to explain over and over again what happened. My hope was that by writing it down, it would run the circles of our small town to help lessen my pain in having to retell it. I never had any intention or thought that it would go viral like it did. “Most of the responses have been very positive. 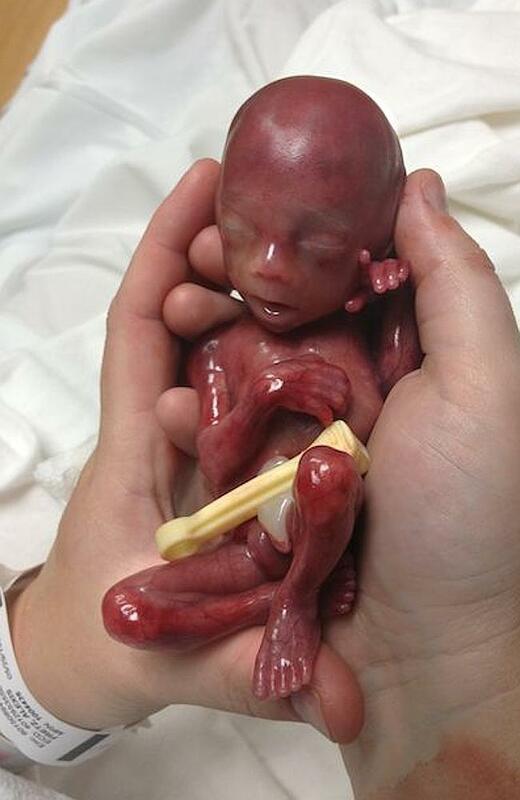 Many have seen Walter’s photos and are shocked at how developed he was at just 19 weeks. Just because the child within cannot be seen by us does not mean that it is a blob of cells. “Walter was perfectly formed and very active in the womb. 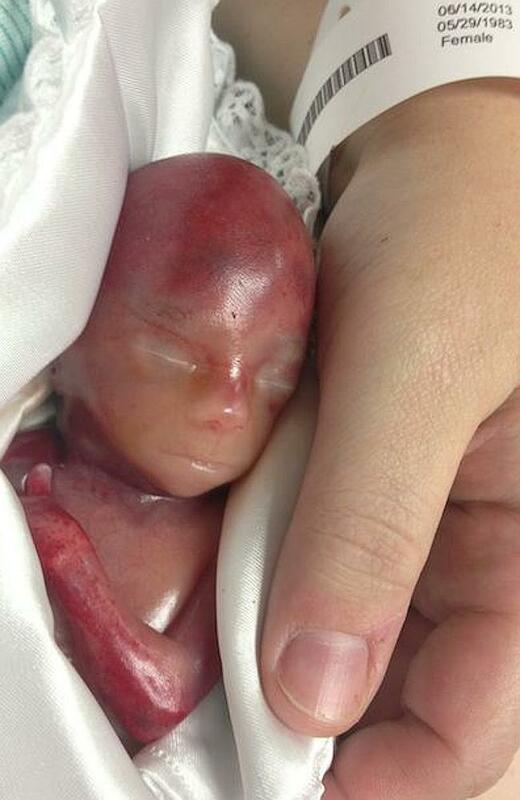 If he had just a few short more weeks he would have had a fighting chance at life. He has struck up many debates in pro-life and pro-choice circles. Again, that was never my intent, but I am glad that he has made people rethink their status on this topic. “I have also received so many emails from women who have told me they have never heard of a situation like their own. Pre-term labour and infant loss is not something the public wants to talk about. To most people it’s not a big deal, you just try again for another baby, so they pretend it never happened and go on with their lives while the mother and family are left in a pile of grief they don’t know how to deal with. 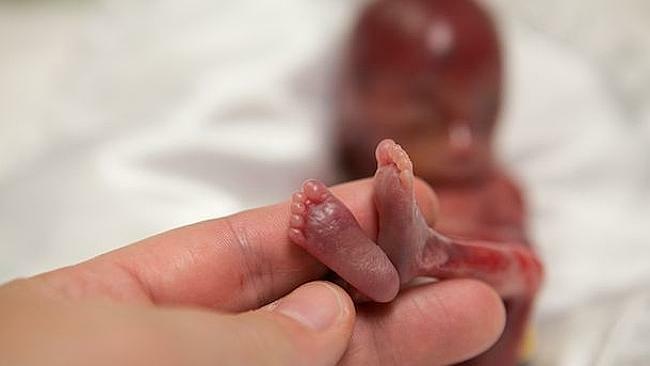 It is also very common for medical staff to take these babies away and dispose of them as medical waste, so many mothers never get to see or hold their babies, or even know if it was a boy or a girl. “I’m heartbroken by the stories I’ve been hearing from people who weren’t allowed to see their child, and seeing photos of an actual baby has brought healing and closure to some. I cannot say enough good things about my doctors and the nurses that were there with me. They never once mentioned the word foetus. They prayed with me, cried with me and were there for my every need. They encouraged us to hold and bond with our son.